One often overlooked aspect of credit investing is the contract between the company and the investor. The formal name of the contract is the Indenture. The indenture contains the description of the bonds (generally) and what the company can and cannot do. What the company can and cannot do are spelled out in the indenture’s covenants. A covenant is defined as an agreement, usually formal, between two or more persons to do or not do something specified. Is bond covenant analysis a thing of the past? Are old school credit guys like me dinosaurs? In good times, it may seem so as investors don’t have to worry about bond covenants as companies are healthy and the risk of being effectively subordinated are low. But what about when the market is not so healthy and/or liquidity dries up? We went through such a market no more than four years ago and chances are, we will go through one again. When this occurs, covenants will be important and those that took the bond covenants into consideration when investing will be better off. 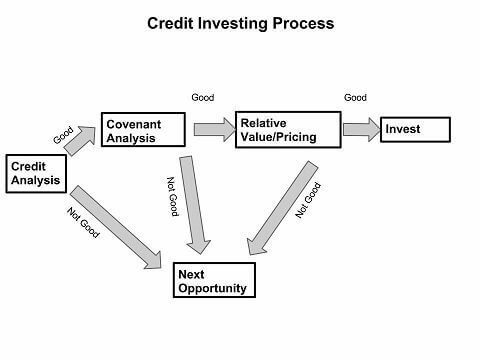 Many investors focus on the first and third steps of the process – the credit analysis and the relative value. While these are very important steps in the process, and carry a large amount of the weight towards an investment decision, they are complemented with covenant analysis. Within the investment grade universe, bond covenants are not the strictest and rarely contain financial covenants. That said, investors should know the details of their contract with the company being considered for investment. 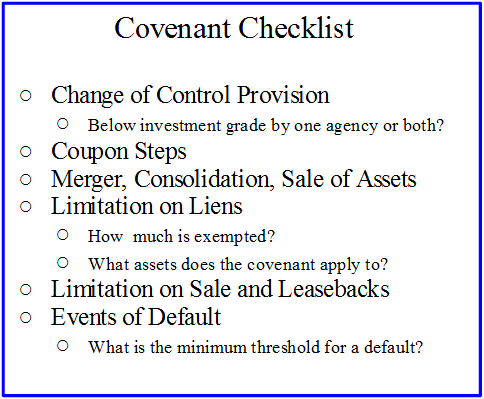 One way to understand the details of the contract, as well to compare covenants across deals/issues is by the use of a covenant checklist. While each deal is unique, the checklist should contain most of the potential covenants available to investors. From the checklist, coupon steps are rather rare, and they are typically used for a low BBB rated entity that is attempting to fund at a lower rate, or an entity that is in the middle of a “resource conversion” or a restructuring of assets through a merger, disposition or acquisition. A change of control covenant may not always seem necessary, but typically they are given no benefit to the issuer in terms of pricing and are good to have – especially in longer dated issues (recall that Clear Channel and TXU were changed hands in very levered transactions where a “COC” would have been a lifesaver). The following is written from a practitioner’s standpoint and is not a legal interpretation and/or document. The best way to show what bond covenants are and how they have to be looked at is through an example. Restriction on Merger and Sales of Assets: UTC may not consolidate with or merge into any other corporation, or convey, lease or transfer its properties and assets substantially as an entirety to any person, unless all three of the following conditions are satisfied: No event of default will have been caused, the surviving entity will assume the indenture and UTC’s counsel will deliver an opinion stating the first two conditions have been met. Check this off the list with the realization that it is relatively easy to meet the conditions and will not stop a merger or sale of assets. Limitation on Liens: Under the indenture, so long as any unsubordinated debt securities are outstanding: UTC will not issue or assume any debt secured by any lien on any principal property owned by UTC or any wholly-owned domestic manufacturing subsidiary; and UTC will not create, incur, issue or assume any debt secured by any lien on any shares of stock or debt of any wholly-owned domestic manufacturing subsidiary. What assets does the covenant apply to? “Principal property,” means any manufacturing plant or warehouse, together with the land upon which it is erected and fixtures constituting a part of the manufacturing plant or warehouse, owned by UTC with a gross book value which exceeds 1% of consolidated net tangible assets. How much is exempted? UTC may incur liens on properties as long as the aggregate principal amount of the secured debt tdoes not exceed 10% of consolidated net tangible assets. Check this off the list – standard terminology for a deal (if you want to have a laugh, call investor relations and ask them for the value of principal properties, or a list of them. 9.5 out of 10 times it will be like you are speaking Greek). Sales and Leasebacks: UTC will not, and will not permit any wholly-owned domestic manufacturing subsidiary to, enter into any sale and leaseback transaction after the date when UTC first issued securities covering any principal property and which has been or is to be sold or transferred more than 120 days after the completion of construction and commencement of full operation of that principal property. How much is exempted? UTC cannot enter into sale and leaseback transactions in an amount (combined with debt secured by liens) that exceeds 10% of the consolidated net tangible assets. Check this off the list – it is standard terminology. any other event of default provided with respect to debt securities of the series. No event of default provided with respect to a particular series of debt securities, except as to events described in the third and fourth bullet points above, necessarily constitutes an event of default with respect to any other series of debt securities (Section 501). Check this off the list realizing that if the company defaults on other debt not covered by the indenture, it does not constitute an event of default under this series. While UTC is unlikely to experience a change of control that results in a downgrade below investment grade, the covenant should have been added. As I stated earlier, this covenant is rare and UTC has no reason to include it, nor would it be expected. Ultimately, the analysis of bond covenants should be part of the analytical process or framework as it makes investors aware of their contract with the issuer. Should there come a time when covenants are in the spotlight or the company is in danger of breaching them, investors who understand their contract will have the ability to act proactively in protection of their capital, principal or investment. There are times when there is no meat on the covenant bone and investors should factor this into their decision and their pricing analysis. There is always another deal, but there is rarely additional protection provided. Can you please explain Convertibles Funds there is one in my 401k that I can invest in $VCVSX Should I use my $VBMPX allocation or my non dividend paying 500 index allocation? Yes it’s a non dividend paying index. I don’t see a mention of the financial covenants?